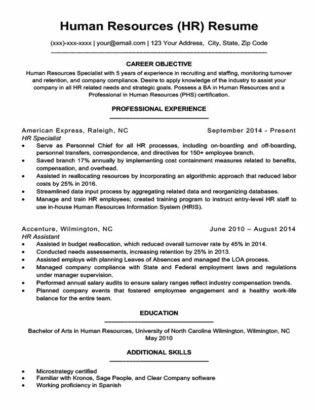 Having trouble writing an Office Manager resume? You’ve come to the right place. The sample and writing tips below will have you creating your own in no time. Too busy for that? Let our comprehensive resume builder do the hard work for you. Finishing up your resume? Keep things moving by perusing our excellent cover letter library. 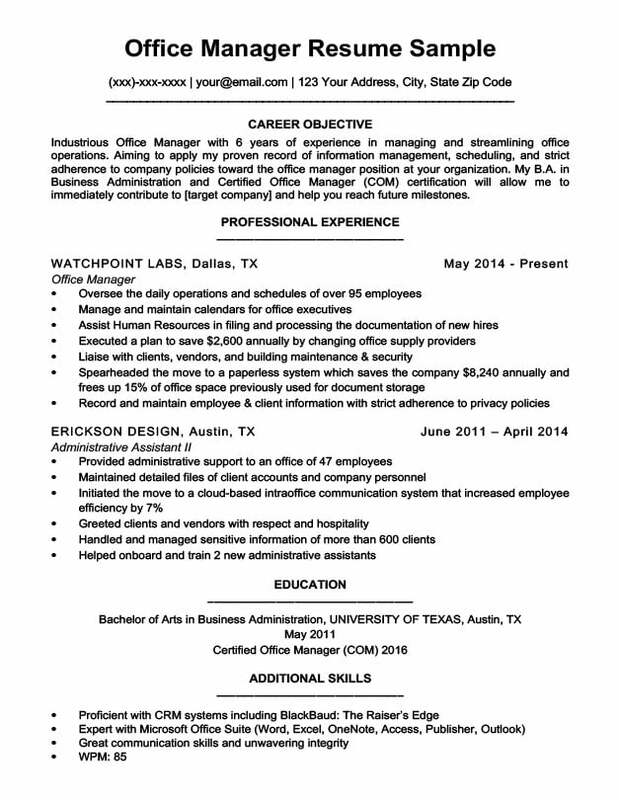 Industrious Office Manager with 6 years of experience in managing and streamlining office operations. Aiming to apply my proven record of information management, scheduling, and strict adherence to company policies toward the office manager position at your organization. My B.A. in Business Administration and Certified Office Manager (COM) certification will allow me to immediately contribute to [target company] and help you reach future milestones. Office Managers are integral to the daily operations of an office. They oversee everything from scheduling, client relations, and information management to the acquisition of equipment and supplies. They coordinate administrative services to provide an office with everything its employees need. Their work ensures that productivity never suffers. According to the Bureau of Labor Statistics, the median salary for someone in this position is $90,050. Successful office managers are reliable, organized, great communicators, and able to multitask. In addition to administrative duties, they must occasionally perform tasks related to accounting or human resources. While their responsibilities vary, their presence is of the utmost importance to the smooth operation of any office. They are like the oil in the engine of a vehicle; no one thinks about it until it’s not there and everything stops working. Fortunately, companies have gotten wise to the advantages of having someone around to manage office affairs. Good office managers are a sought-after commodity, and are thus compensated handsomely. According to the Bureau of Labor Statistics, the median salary for someone in this position is $90,050. The catch is, typical requirements for this role include a bachelor’s degree and several years of experience. In this guide, we provide three tips to help you write a great resume for this position. If your professional experience is not as ideal as that depicted in our sample, have a look at our life situations template guide for more help crafting a great resume. Office Managers play an important organizational role for any sizable office, so hiring managers will want to be certain that you are the right person for the job. This means that they will read carefully through your previous experience and accomplishments. They will want to see the extent and range of your duties, as well as your relevant achievements. Office managers are expected to be leaders, not passengers. It will be assumed that you can handle basic administrative tasks like answering phones and entering data. There is no need list them. Instead, you will want to describe how you managed your office, helped employees achieve goals, and took initiative when appropriate. You can do this by curating your resume to show how valuable you were to your previous employers. The statements are nearly identical. However, the second one gives the impression that the applicant had a plan and followed through with it. The first statement gives very little indication as to whether she had any role in the decision to go paperless. In fact, it seems like she may have simply followed orders and took the steps required of her. While there is nothing wrong with this, office managers are expected to be leaders, not passengers. Again, they are nearly identical. In fact, in this example the difference in meaning is even more nuanced. The word “gave” in the first statement is a weak, generic verb and in this example gives the impression of obligation. The applicant was required to give administrative support, so she did so. In the second statement, however, the word “provided” gives the impression that she made the decision to support the office administratively. In this way, leadership qualities are implied. Using strong action verbs to describe your experience will emphasize your leadership qualities. You should replace generic verbs with strong ones whenever it is appropriate to do so. You may have to reorder a sentence to fit them in, but it will be worth it. Quantification is not always easy, but you should try to do so in at least three bullet points under each employment experience. In these two statements, the task the applicant performed was the same. However, the second statement paints a more detailed picture of the size of the office she worked at and the extent of her tasks. The hiring manager knows not only that she can handle a relatively large office, but that she is attentive and meticulous in her work. Additionally, we can see that she used a strong action verb in “oversee”, which gives the impression that her role was that of a supervisor, not an assistant. The first statement is vague and generic, whereas the second one is concrete and specific. We know the scope of her achievement. This is because of the numbers. If there had been any savings at all, the first statement would be true. By quantifying her experience, the applicant shows the hiring manager that she is competent and can produce results. How many employees were in the office you managed? Were you responsible for saving the company any time or money? If so, how much? Were you responsible for reducing costs or waste? If so, how much? How many people’s schedules did you manage? Did you help train or onboard new hires? If so, how many? Did you manage any administrative assistants? If so, how many? Were you responsible for handling clients or accounts? If so, how many? How many departments did you oversee? Quantifying your experiences will give you a leg up on other candidates and give the hiring manager a positive impression of you. If you need more help, see our section on how to write a great professional experience section in our resume writing guide. Soft skills are the individual personality traits that determine whether you will work well with your colleagues and be a good fit at a company. These are intangible, but extremely important for most office workers. Soft skills include things like good communication, honesty, teamwork, punctuality, integrity, and organization. Hard skills are those that are teachable. They are things like the ability to use certain software packages and speak foreign languages. Office managers need a number of hard skills to successfully handle their responsibilities. However, it is often the soft skills one possesses that make an office manager indispensable. Hiring managers will assume you can handle basic administrative tasks. You shouldn’t put those skills in your resume. You should include these in your resume where possible. A good place to do so is the Additional Skills section. Although this section should contain mostly hard skills, you can add a bullet or two to include soft skills that accurately describe your personality and are appropriate for an office setting. Another place you can highlight a soft skill is in your Career Objective section. In the sample resume above, the applicant describes herself as “industrious” in the first line. She is using an effective adjective to convey a soft skill without actually listing it in the skills section. Subconsciously, this will register with the hiring manager and increase the likelihood that you will be called for an interview. If you need more help crafting your additional skills section, have a look at our skills section writing guide. While office manager positions typically require several years of experience, hiring managers are adept at recognizing talent and ability. If your qualifications don’t exactly stack up to those in the sample above, have no fear. You can still create a resume that accentuates your positive attributes in a way that can get your foot in the door. Get started by jumping right into our custom resume builder and build yours in mere minutes!